Click to download the full book! 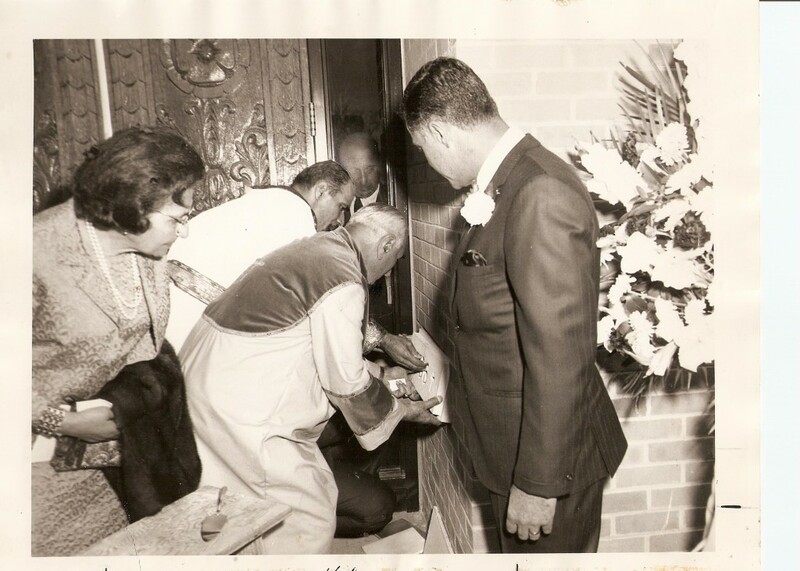 This history begins with the consecration of the Church at its present location at 8701 Ridge Avenue, Philadelphia, PA, on Sunday, May 21, 1967. The move from the 16th and Oxford Streets location in Philadelphia was necessitated by the need for more modern facilities and grounds. The relocation was initiated with a fund raiser in 1957, followed by the purchase of the present property in 1959. 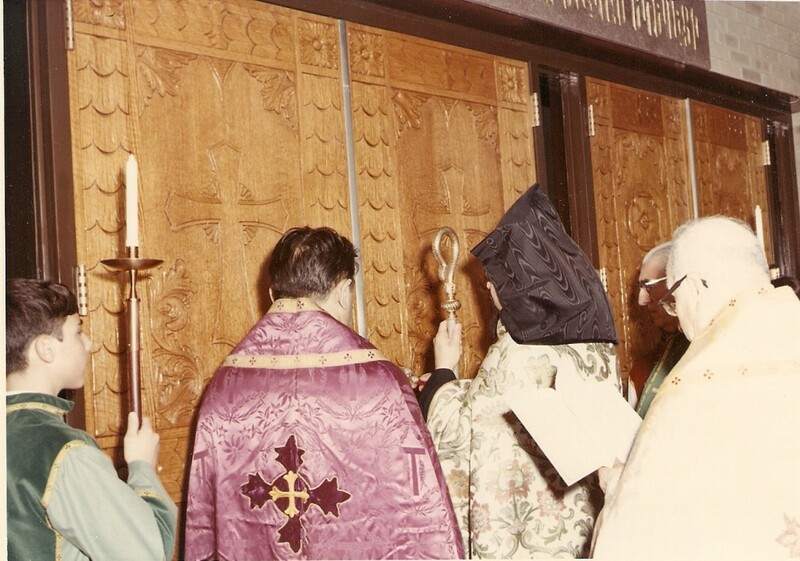 A chapel (the present Community Center) was established for sacraments and divine liturgy in 1963; construction in 1965; and culminated with the Church consecration in 1967. The initial efforts of the church leaders was to sustain the enthusiasm that had been generated within the congregation during the fund raising, planning, and construction of the new church. The first months saw increased activity by all of the church groups. The Board of Trustees sponsored several Teas recognizing the efforts of the devoted members of the various committees that had been formed to plan, build, and furnish our new church. The first person to receive an award at the new venue was Mrs. Artemis Arpajian for her dedication to the cause of Armenian language schools. The first Communion Breakfast was organized in 1968 for our high school and college graduates and their families. This function has been very successful and continues to this day. Mrs. Sandra Selverian has been instrumental in organizing the event; each graduate is presented with a book pertaining to Armenian culture. 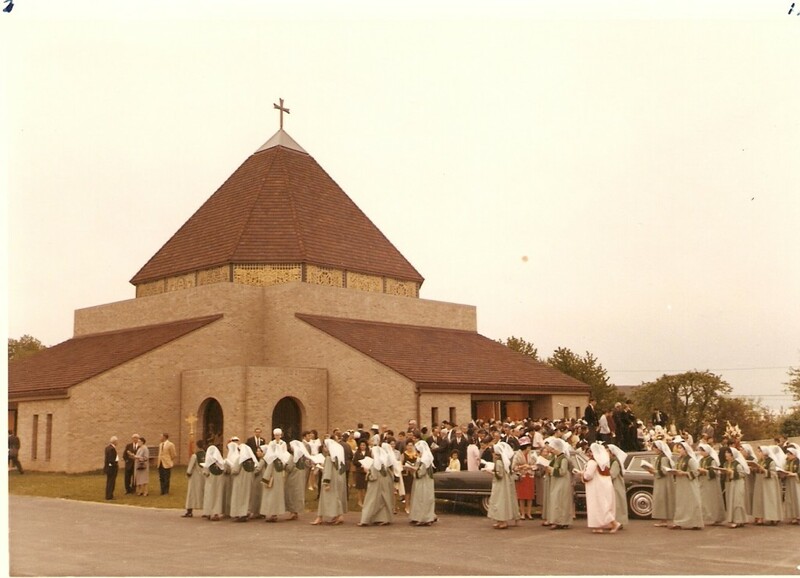 In 1968, more than 500 enthusiastic parishioners were present at the first anniversary celebration of the consecration of the Church and pledged an impromptu $20,000. In conjunction with the National Representatives Assembly (NRA) meeting held in Philadelphia in May 1969, the Church at this location had its first visit from a sitting Catholicos, His Holiness Khoren I. At the conclusion of the NRA, Vehapar presided over the banquet and conferred the medal Prince of Cilicia upon Mr. Yeghishe Melikian for his 45 years of service on the local and national levels. Mrs. Sirvart Melikian was presented the Princess of Cilicia medal for her support. Vehapars closing remarks directed us to turn our energies towards building a Prelacy headquarters in America. January 18, 1971, was a milestone for our Church as we celebrated the burning of the mortgage. This was an unprecedented, rapid retirement of the debt which was symbolized by three generations in the persons of Mr. Sarkis Zartarian (older), Mr. Nazareth Emlikian (present), Miss Linda Giragosian and Master Richard Selverian (future) lighting the mortgage document with candles along with Rev. Arsen Hagopian. Rev. Hagopian was honored on this date for the 20th anniversary of his entry into the priesthood. A banquet attended by 400 parishioners marked the occasion. The National Representative Assembly convened again in Philadelphia in 1972. Although his name was not on the ballot, Archbishop Karekin Sarkissian was elected Prelate by a majority write-in-vote. In 1974 the Board of Trustees honored Mr. Garabed Giragosian, Mrs. Elizabeth Sadjian, and Miss Victoria Babaian for their long and distinguished service. The Silver Anniversary of the ordination of Rev. Hagopian took place in 1976; it also marked his 21st year as our Pastor. In 1979 the Board of Trustees decided to allow the utilization of the former parish house on our property as a Community Center. A separate committee was authorized to administer the center and assume responsibility for its maintenance and operation. The Community Center became self sufficient with revenues from hosting Friday night dinners and rentals. These activities continue to this day. In 1983 the National Representative Assembly again convened in Philadelphia. In the same year, His Holiness Karekin II, Catholicos of the See of Cilicia, (formerly our Prelate) made a Pontifical visit to our parish. A Pontifical Mass was celebrated followed by a banquet. Vehapar presented the St. Gregory medal to Mr. Sarkis Zartarian for his years of service and also bestowed the honor of Knight of Cilicia upon Mr. Nazareth Emlikian. In 1984, the Very Rev. Anoushavan Tanielian, with the permission of our Prelate Archbishop Mesrob Ashjian, was invited to become the preacher at St. Gregorys Church. Hayr Anoushavan was able to attract many of our young adults to bible classes, vesper services, and seminars. He made our religion more understandable by translating certain ceremonies from the Grapahr to a modern Armenian and English. He was also instrumental in organizing a highly successful Sharagan Choir under the direction of Mrs. Maroush Paneyan Nigon. The twentieth Anniversary of the consecration of our church was celebrated over a three-day period beginning on May 22, 1987. The Sharagan Choir offered a program of our beautiful sharagans (hymns). 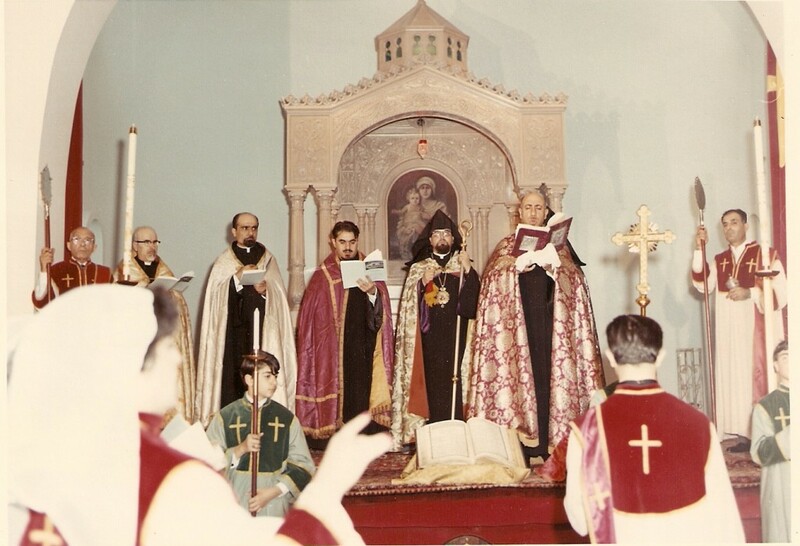 On Sunday, May 24, 1987, our Prelate, Archbishop Mesrob Ashjian celebrated the Badarak. At a banquet following the Badarak, the Surpazan also honored 48 ladies who were members of St. Gregorys Ladies Guild for 25 or more years of service. Surpazan then recounted his involvement with the Philadelphia Community, adding that it was one of the pillars of the Prelacy, not only because it supported all of its programs, but also that it provided many leaders to help guide the Prelacy. In 1991 Archpriest Hagopian announced his retirement after 35 years of service to our Church. The Board of Trustees accepted this news and set June 30, 1991 as the official date. After discussions with the Prelacy the Rev. Nerses Manoogian of St. Gregorys in Granite City, IL was chosen to succeed Rev. Hagopian and started on June 19, 1991. A testimonial retirement dinner was held in honor of Rev. Hagopian on September 19, 1991 at the Adams Mark Hotel. More than 500 people were in attendance at this farewell dinner. Many of the attendees were members of our sister churches in Philadelphia as Der Arsen was highly regarded by all who know him. The 25th anniversary of the consecration of our church was celebrated on October 4, 1992. In tribute to 25 years at the Ridge Avenue, hundreds of parishioners gathered to mark the occasion in prayer. Our Prelate, Archbishop Ashjian, presented Prelacy awards to the Ladies Guild, the Mens Club, and to parishioners Mr. Setrak Ejdaharian, Ms. Nartouhi Selverian, and Mr. John Tokmajian for decades of dedicated service. His Eminence also bestowed the Knight of Cilicia medal to parishioner Harry Dombalagian. Earlier in the day he had granted the right to wear the pectoral cross or Lancha Khatch upon Rev. Nerses Manoogian. During these 30 years the size of our congregation has more than doubled. The immigration of our Armenian compatriots from foreign shores to the Philadelphia area has been a major contributor to this growth. This has contributed to the renewed vitality of the Armenian culture and language in our Church. In the early 1990s, our facility closing in on its third decade of existance, became in need of major infrastructure repairs necessitating special fund raising efforts. Included were significant roof repairs, new tables and chairs for the hall, and the purchase of a new organ. The congregation responded to these needs generously. Looking to the future, a capital fund was established in 1992 to build an endowment such that the interest from those funds would pay for future infrastructure repairs. The youth of St. Gregorys have always been an important part of the Church community. We have always maintained an active Sunday School where religious teachings nourish the children. A Sunday nursery was opened for pre-Sunday School age children where younger children can enjoy the company of members their own age in an Armenian Christian setting. A youth ministry was started to attract the older children. A recent well-received activity has been the annual Christmas pageant which is held in the Church Sanctuary. The format of our longtime publication, The Illuminator, was changed in September 1991 to be a more effective means of communication with our parishioners and provide spiritual education. The weekly bulletin which was established in 1987, was baptized with a new name and was redesigned in 1993 and is now called The Vine. Another National Representative Assembly was hosted in 1994. Archbishop Ashjian was unanimously reelected as Prelate. The activities during the week featured Lady Caroline Anne Cox, Deputy Speaker of Britains House of Lords, who received the Prelacys Grand Public Service Award for her service to the Karabagh Armenians. The customary banquet was held to close the National Representatives Assembly. Archbishop Ashjian presided and presented awards Archdeacon Nazareth Nazarian, Mrs. Grace Keshgegian, and Mr. Meran Elanjian. Also honored were long time members of the Prelacy Council, Mr. Harry Dombalagian and Nazareth Emlikian. 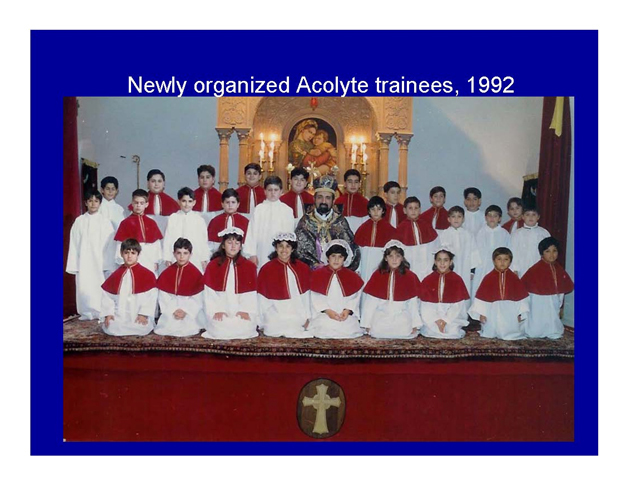 In 1995, the community witnessed the ordination of 17 acolytes and one deacon by Archbishop Ashjian. This was truly a milestone in our Church with so many young people expressing their dedication to the Church. They continue to serve on the altar each Sunday. In looking to the future a Vision 2000 project was initiated in 1996 with an all-day workshop to develop programs to carry our community into the 21st century. The programs support the youth, community involvement, spirituality and the financial stability of our church. The present Board of Trustees has initiated a project to increase the capital endowment. A decorative panel depicting our church will be used to signify donations to the capital fund and will be placed in the Narthex. In this thirtieth year of our Church, our parishioners look forward to the planned visit of our new Catholicos, His Holiness Aram I of the Great House of Cilicia in October. Although we are celebrating the thirtieth anniversary of the consecration of our Church, we are in the seventieth year of existence as St. Gregory the Illuminator Armenian Apostolic Church of Philadelphia area. Our supreme ideals of faith and dedication to the preservation of our Church and our nation are intact. It is hoped that the Vision 2000 program, now in its beginning will give further inputs to our youth to continue the faith and dedication of our forefathers. Board of Trustees: John Tokmajian C, Nazareth Emlikian T, Sarkis Zartarian S, Meran Elanjian, George Dombalagian, Nazareth Nazarian, Stephen Selverian, Puzant Ajderian, Diran Selverian, Sarkis Giragosian, Garabed Giragosian. N.R.A. Delegates: Walter Kurkian, Yeghishe Melikian, John Tokmajian, George Domabalgian, Yeprad Selverian, Puzant Ajderian, Nazareth Emlikian. Board of Trustees: Nazareth Emlikian C, George Kamajian, George Sookiasian T, Stephen Selverian, Joseph Vosbikian, Harry Dombalagian, Sarkis Giragosian, Sarkis Zartarian S, Nazareth Nazarian, George Dombalagian, Meran Elanjian. N.R.A. Delegates: Walter Kurkian, Yeghishe Melikian, John Tokmajian, George Dombalagian, Yeprad Selverian, Puzant Ajderian, Nazareth Emlikian. Board of Trustees: Nazareth Emlikian C, Vasken Arpajian T, Sarkis Zartarian S, Hagop Apelian, Charles Giragosian, Nazareth Nazarian, Harry Dombalagian, George Kamajian, George Sookiasian, Stephen Selverian. Board of Trustees: Nazareth Emlikian C, Nazareth Nazarian S, Vasken Arpajian T, Sarkis Zartarian, Garabed Giragosian, George Sookiasian, Harry Dombalagian, Hagop Apelian, Joseph Vosbikian, Jack Nercesian, Souren Sadjian. N.R.A. Delegates: Walter Kurkian, John Tokmajian, Nazareth Emlikian, Puzant Ajderian, Meran Elanjian, Vasken Arpajian. Board of Trustees: Nazareth Emlikian C, Edward Tufankjian, Harry Dombalagian, Souren Sadjian, George Sookiasian T, Nazareth Nazarian S, Vasken Arpajian, Sarkis Zartarian, Garabed Giragosian, Jack Nercesian, Joseph Vosbikian. Board of Trustees: Harry Dombalagian C, Nazareth Nazarian S, George Kamajian, Meran Elanjian, Souren Sadjian, George Sookiasian T, Sarkis Zartarian, Garabed Giragosian, Vasken Arpajian, John Hodian, Edward Tufankjian. Board of Trustees: Harry Dombalagian C, John Hodian S, Garabed Giragosian, Vasken Arpajian, Sarkis Zartarian, Manoug Manougian, Jack Derderian, George Sookiasian T, Souren Sadjian, Meran Elanjian, George Kamajian. N.R.A. Delegates: Yeghishe Melikian, Nazareth Emlikian, Walter Kurkian, John Tokmajian, Yeprad Selverian, Puzant Ajderian, Harry Dombalagian. Board of Trustees: Nazareth Emlikian C, Harry Dombalagian, Meran Elanjian, John Hodian, George Kamajian, Souren Sadjian T, Sarkis Zartarian S, Vasken Arpajian, Garabed Giragosian, Jack Derderian, Manoug Manougian. Board of Trustees: Nazareth Emlikian C, Meran Elanjian, Souren Sadjian, Sarkis Giragosian T, George Karian, Hratch Paneyan, Antranig Bedrossian S, Ralph Jehanian, Jack Derderian, Manoug Manougian. Board of Trustees: Meran Elanjian C, Souren Sadjian, Sarkis Giragosian, Lucille Jehanian, Jack Derderian, Antranig Bedrossian S, Hratch Paneyan T, Peter Endrigian, Ralph Jehanian, George Karian, Nartouhi Selverian. Board of Trustees: Meran Elanjian C, Martin Shelengian, Antranig Bedrossian S, Ralph Jehanian, Hratch Paneyan T, John Hodian, Nartouhi Selverian, George Karian, Sarkis Giragosian, Lucille Jehanian, Souren Sadjian. Board of Trustees: Nazareth Emlikian C, Nartouhi Selverian, George Sookiasian T, George Shamlian, Lucille Jehanian, Souren Topjian S, Antranig Tumaian, Martin Shelengian, Ralph Jehanian, John Hodian, Antranig Bedrossian. N.R.A. Delegates: Meran Elanjian, Vasken Arpajian, George Dombalagian, George Kamajian, Gosdan Bozajian, Bedros Frounjian, Harry Dombalagian. Board of Trustees: Nazareth Emlikian C, Albert Soltanian, Antranig Tumaian, Steve Vosbikian, Vrej Bedrossian, Philip Der Pilibosian, Souren Topjian S, George Sookiasian T, Lucille Jehanian, Nartouhi Selverian, George Shamlian. Board of Trustees: Antranig Bedrossian C, George Shamlian, George Sookiasian T, Souren Topjian S, George Semerjian, Norman Deirmenjian, Albert Soltanian, Vrej Bedrossian, Antranig Tumaian, Philip Der Pilbosian, Steve Vosbikian. N.R.A. Delegates: Nazareth Emlikian, Vasken Arpajian, Gosdan Bozajian, Meran Elanjian, Bedros Frounjian, George Kamajian, Harry Dombalagian. Board of Trustees: Antranig Bedrossian C, Souren Topjian S, George Shamlian, Vrej Bedrossian, George Sookiasian T, Michael Nalbantian, Set Ejdaharian, Jack Vosbikian, Philip Der Pilbosian, William Arthin, George Semerjian. N.R.A. Delegates: Vasken Arpajian, Gosdan Bozajian, Antranig Tumaian, Meran Elanjian, Nazareth Emlikian, Bedros Frounjian, George Kamajian. Board of Trustees: Antranig Bedrossian C, Souren Topjian S, Hagop Ishkhanian, Bearg Jehanian, Sirvart Kaloustian, William Arthin T, Bessie Baker, Vrej Bedrossian, Set Ejdaharian, George D. Garabedian, Jack Vosbikian. N.R.A. Delegates: Antranig Bedrossian, Souren Topjian, George Kamajian, George Sookiasian, Bedros Frounjian. Board of Trustees: Antranig Bedrossian C, Set Ejdaharian, Souren Topjian S, Sirvart Kaloustian, William Arthin T, Bessie Baker, George D. Garabedian, Vrej Bedrossian, Jack Vosbikian, Bearg Jehanian, Hagop Ishkhanian. N.R.A. Delegates: Antranig Tumaian, Antranig Bedrossian, Bedros Frounjian, George Kamajian, George Sookiasian, Souren Topjian, Nazareth Emlikian. Board of Trustees: William Arthin C, Bessie Baker T, Vrej Bedrossian, Set Ejdaharian, George D. Garabedian, Jack Vosbikian, Antranig Bedrossian, Bearg Jehanian, Sonia Jehanian S, Raffi Panosian, Souren Topjian. Board of Trustees: William Arthin C, Antranig Bedrossian, Souren Topjian S, Jirair Hovagimyan, Ralph Jehanian T, Vrej Bedrossian, Garbis Aydjian, George D. Garabedian, Bearg Jehanian, Sonia Jehanian, Raffi Panosian. N.R.A. Delegates: Antranig Bedrossian, Nazareth Emlikian, Bedros Frounjian, George Kamajian, George Sookiasian, Souren Topjian, Antranig Tumaian. Board of Trustees: William Arthin C, Richard Mukalian, Jr. , Jirair Hovagimyan S, Martin Shelengian, Ralph Jehanian T, Grace Keshgegian, Garbis Aydjian, Vrej Bedrossian, Jack Derderian, George D. Garabedian, Daniel Terhanian. N.R.A. Delegates: Antranig Bedrossian, Nazareth Emlikian, Harry Dombalagian, Jack Papazian, George Sookiasian, Souren Topjian, Antranig Tumaian. Board of Trustees: William Arthin C, Richard Mukalian, Jr. , Jirair Hovagimyan S, Vrej Bedrossian, Grace Keshgegian T, Richard Selverian, Garbis Aydjian, Jack Derderian, Vartan Karakelian, Martin Shelengian, Daniel Terhanian. Board of Trustees: William Arthin C, Grace Keshgegian, Souren Topjian S, Robin Jehanian Barnett, Richard Selverian T, Vartan Karakelian, Garbis Aydjian, Vrej Bedrossian, Joseph Frounjian, Jirair Hovagimyan, Daniel Terhanian. N.R.A. Delegates: Antranig Bedrossian, Harry Dombalagian, Jack Papazian, Martin Shelengian, George Sookiasian, Souren Topjian, Antranig Tumaian. Board of Trustees: Grace Keshgegian C, Joseph Frounjian, Souren Topjian S, Andrew Kzirian, Richard Selverian T, Maral Kaloustian, Robin Barnett, Set Ejdaharian, Vartan Karakelian, Robert Tashjian, Daniel Terhanian. N.R.A. Delegates: William Arthin, Vrej Bedrossian, Harry Dombalagian, Jack Papazian, Martin Shelengian, George Sookiasian, Souren Topjian. Board of Trustees: Meran Elanjian C, Joseph Frounjian, Souren Topjian S, Andrew Kzirian, Richard Selverian T, Maral Kaloustian , Set Ejdaharian, Ralph Jehanian, Vartan Karakelian, Souren Sadjian, Albert Soltanian. N.R.A. Delegates: William Arthin, Vrej Bedrossian, Harry Dombalagian, Nazareth Emlikian, Grace Keshgegian, Jack Papazian, Martin Shelengian. Board of Trustees: Meran Elanjian C, Hratch Paneyan, Andrew Kzirian S, Richard Selverian T, Albert Soltanian, Set Ejdaharian, Joseph Frounjian, Ralph Jehanian, Vartan Karakelian, Souren Sadjian. Board of Trustees: Meran Elanjian C, Hratch Paneyan, Andrew Kzirian S, Vartan Karakelian, Richard Selverian T, Albert Soltanian, Niki Arakelian, Set Ejdaharian, Ralph Jehanian, Souren Sadjian, Noubar Yeremian. N.R.A. Delegates: William Arthin, Vrej Bedrossian, Harry Dombalagian, Nazareth Emlikian, Hovhannes Kazanjian, Grace Keshgegian, Jack Papazian. Board of Trustees: Meran Elanjian C, Hratch Paneyan, Karen Jehanian S, Souren Sadjian, Albert Soltanian T, Mark Selverian, Niki Arakelian, George Avetian, Set Ejdaharian, Ralph Jehanian, Noubar Yeremian. Board of Trustees: Jack Papazian C, William Arthin, Karen Jehanian S, Noubar Yeremian, Mark Selverian T, Victor Sarkissian, George Avetian, Set Ejdaharian, Kenneth Nigon, Hratch Paneyan, Mihran Vartanian. N.R.A. Delegates: William Arthin, Vrej Bedrossian, Bedros Frounjian, Hovhannes Kazanjian, Grace Keshgegian, Albert Soltanian, Noubar Yeremian. Board of Trustees: Jack Papazian C, William Arthin, Karen Jehanian S, Kenneth Nigon, Richard Shelengian T, Victor Sarkissian, Harout Aghajanian, George Avetian, Hrant Jilozian, Mihran Vartanian, Noubar Yeremian. Board of Trustees: Jack Papazian C, William Arthin, Karen Jehanian S, Kenneth Nigon, Richard Shelengian T, Hrant Jilozian, Harout Aghajanian, George Avetian, Kirk Karakelian, Edward Papazian, Lena Ohannessian Streeter. N.R.A. Delegates: William Arthin, Vrej Bedrossian, Bedros Frounjian, Vartan Karakelian, Grace Keshgegian, Albert Soltanian, Noubar Yeremian. Board of Trustees: Jack Papazian C, William E. Arthin, Harout Aghajanian, Hrant Jilozian T, Kirk Karagelian, Karen Jehanian, Noubar Megerian, Ken Nigon S, Mitchel Obozian, Edward Papazian, Lena Ohannessian Streeter. N.R.A. Delegates: Bedros Frounjian, Karen Jehanian, Vartan Karakelian, Grace Keshgegian, Jack Papazian, Albert Soltanian, Noubar Yeremian. Board of Trustees: Noubar Megerian C, Harout Aghajanian, Harnt Jilozian, Kirk Karagelian, Sonia Nalbantian, Kenneth Nigon, Mitchell Obozian, Glenn Papazian, Kurk D. Selverian T, Michael Shamlian, Lena Ohannessian Streeter S.
N.R.A. Delegates: Bedros Frounjian, Karen Jehanian, Vartan Karakelian, Jack Papazian, Stephen Selverian, Albert Soltanian, Noubar Yeremian. Board of Trustees: Mr. Noubar Megerian C, Kim Jehanian, Sonia Jehanian, Mr. Kirk Karagelian, Mrs. Sonia Nalbantian, Dr. Lena Ohannessian S, Mr. Glenn Papazian, Mr. Richard Selverian T, Mr. George Semerjian , Mr. Michael Shamlian, Mr. Brian Tavakalian. N.R.A. Delegates: Mr. Joseph Frounjian, Ms. Karen Jehanian, Mr. Noubar Megerian, Mr. Jack Papazian, Mr. Stephen Selverian, Mr. Albert Soltanian, Mr. Noubar Yeremian. Board of Trustees: Mr. Noubar Megerian C, Kim Jehanian, Sonia Jehanian, Mr. Kirk Karagelian, Mrs. Sonia Nalbantian, Dr. Lena Ohannessian S, Mr. Glenn Papazian, Mr. Richard Selverian T, Mr. George Semerjian, Mr. Michael Shamlian, Mr. Brian Tavakalian. Board of Trustees: Noubar Megerian C, Niki Arakelian, William E. Arthin, Sonia Jehanian S, Glenn Papazian, Richard D. Mukalian, Jr, Arsine Oshagan, Michael Shamlian, Albert Soltanian, Jr., Richard Selverian T, Brian Tavakalian. N.R.A. Delegates: Joseph Frounjian, Karen Jehanian, Hrant Jilozian, Noubar Megerian, Hratch Paneyan, Jack Papazian, Stephen Selverian. Board of Trustees: Noubar Megerian C, Niki Arakelian, William E. Arthin, Sonia Jehanian S, Richard D. Mukalian, Jr., Arsine Oshagan, Glenn Papazian, Richard Selverian T, Michael Shamlian, Albert Soltanian, Jr., Brian Tavakalian. Board of Trustees: Glenn Papazian C, Harout Aghajanian, Niki Arakelian, William E. Arthin, Maryann Karagelian S, Richard D. Mukalian, Jr., Arsine Oshagan, Jack Papazian, Richard Selverian T, Albert Soltanian, Jr., Brian Tavakalian. Board of Trustees: Jack Papazian C, Harout Aghajanian, Niki Arakelian, William E. Arthin, Raffi Jehanian, Hrant Jilozian, Maryann Karagelian S, Arthur Selverian, Richard Selverian T, Albert Soltanian, Jr. , Brain Tavakalian. N.R.A. Delegates: Joseph Frounjian, Karen Jehanian, Hrant Jilozian, Noubar Megerian, Hratch Paneyan, Nora Selverian, Stephen Selverian. Board of Trustees: Jack Papazian C, Harout Aghajanian, Kurt Ajdaharian, Niki Arakelian, William E. Arthin, Raffi Jehanian, Maryann Karagelian S, Silva Santerian, Arthur Selverian, Richard Selverian T, Albert Soltanian, Jr.
N.R.A. Delegates: Joseph Frounjian, Hrant Jilozian, Noubar Megerian, Jeanette Nazarian, Lena Ohannessian, Hratch Paneyan, Nora Selverian. Board of Trustees: Bill Arthin C, Ken Nigon, Kurt Ajdaharian, Niki Arakelian, Aram Hovagimian, Raffi Jehanian, Maryann Karagelian S, Silva Santerian, Arthur Selverian, Mark Selverian T, Albert Soltanian, Jr.
Board of Trustees: Glenn Papazian C, Ken Nigon, Kurt Ajdaharian, Aram Hovagimian, Raffi Jehanian, Maryann Karagelian S, Silva Santerian, Arthur Selverian, Mark Selverian T, Brian Tavakalian, Noubar Yeremian. N.R.A. Delegates: Hrant Jilozian, Jeanette Nazarian, Hratch Paneyan, Jack Papzian, Nora Selverian, Steve Selverian, Richard Selverian. Board of Trustees: Glenn Papazian C, Ken Nigon, Kurt Ajdaharian, Raffi Jehanian, S, Silva Santerian, Arthur Selverian, Mark Selverian T, Minas Shirozian, Brian Tavakalian, Noubar Yeremian. Board of Trustees: Glenn Papazian C, Ken Nigon, Mark Selverian T, Mike Injaian S, Kurt Ajdaharian, Berge Deirmengian Miller, Mikael Garabedian, Gary Papazian, Minas Shirozian, Brian Tavakalian, Noubar Yeremian. N.R.A. Delegates: Harout Aghajanian, Dr. Ara Chalian, Jeanette Nazarian, Dr. Arsine Oshagan, Nora Selverian, Steve Selverian, Richard Selverian. Board of Trustees: William Arthin C, Ken Nigon, Mike Injaian T, Glenn Papazian S, Berge Deirmengian Miller, Mikael Garabedian, Gary Papazian, Lucinda Selverian, Minas Shirozian, Brian Tavakalian, Noubar Yeremian. Board of Trustees: William Arthin C, Berge Deirmengian Miller, Mike Injaian T, Ken Nigon S, Dr. Ara Chalian, Aram Hovagimian, Gary Papazian, Lucinda Selverian, Minas Shirozian, Brian Tavakalian, Noubar Yeremian. N.R.A. Delegates: Harout Aghajanian, Dr. Ara Chalian, Jeanette Nazarian, Dr. Arsine Oshagan, Silva Santerian, Nora Selverian, Richard Selverian.